You are looking at my present Hemi restoration project. This one has just been completed.I bought this engine from Don Garlits back in Feb,1998. All of the machine work was completed by Express Engines. The block was bored .060 over. Align honed and parallel decked. Cast pistons and rotating assembly was balanced. The Hemi heads have all the seats replaced. New valves, springs and guide inserts. Kanter supplied the overhaul kit. Many many hours went into this restoration so that it would be completely stock as it was in a car back in 1953. 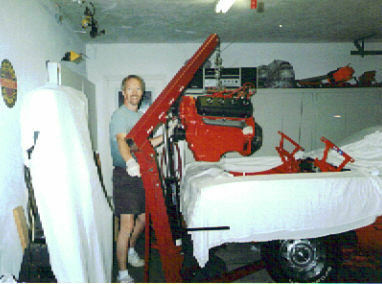 I drove this engine up until I sold the car, in January 2005. It has 700 miles on it. It runs so smooth and can pull real hard. 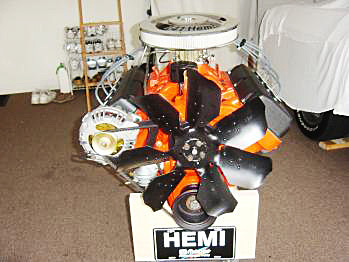 I build Hemi engines. Thank you Kelly for believing in me and for the famous plate. You are loved.